When you look at your smile, do you notice little flaws in your teeth that you wish you could change? Perhaps you think it would take several complicated cosmetic procedures to address them all. Well, we have a solution that may be able to help—porcelain veneers. They can make you and your smile stand out in the best possible way. In as little as two appointments, you can get the teeth you’ve always dreamed of with porcelain veneers. Discoloration in teeth that doesn’t respond to professional whitening. If you have any of these flaws in your teeth, we invite you to discuss getting porcelain veneers with Dr. Tripulas. Natural appearance. The porcelain material reflects light just like enamel, so the results look lifelike. Versatility. They can address many different kinds of imperfections all in one procedure. Durability. Porcelain veneers can certainly withstand normal wear and tear. Stain resistance. In fact, they resist stains better than natural tooth enamel. Biocompatibility. They shouldn’t irritate the gums or your teeth, making them a safe cosmetic option. He will remove a small portion of the enamel on the front surface of your teeth to make room for your veneer. We will take impressions of your teeth and send this information to a dental lab where they specialize in crafting custom veneers. Then Dr. Tripulas will place temporary veneers. When the final products are ready, you will return to our Wharton office to have them bonded to your teeth, instantly transforming the look of your smile. Porcelain veneers aren’t right for everyone. Because it is a cosmetic procedure, your teeth need to be healthy before it can be performed. 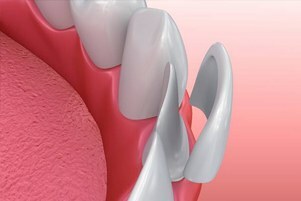 If your tooth is decayed, for example, you are not eligible for porcelain veneers. 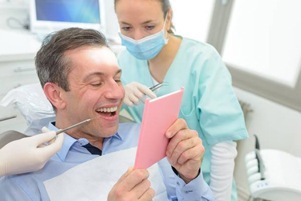 If, however, you are in good oral health, chances are that you’ll be able to get the procedure. If you have several flaws occurring at the same time, such as small gaps between discolored teeth, porcelain veneers can be a particularly helpful solution. Instead of having multiple separate procedures done, you can opt for just one with porcelain veneers. The best way to know whether you’re a good candidate for porcelain veneers is to schedule an appointment with Dr. Tripulas to discuss your specific situation. Our team of experienced professionals is committed to helping you achieve your smile goals. We look forward to working with you and giving you a smile you’ll be proud to show off. Schedule an appointment today to get started!